Why Did They Call These Tiny-Brain Hominids “Almost Human”? A recent book on paleontology is the book Almost Human: The Astonishing Tale of Homo naledi and the Discovery That Changed Our Human Story. The book is by two paleontologists named Lee Berger and John Hawks. They and their colleagues found some fossils of a species called Homo naledi. So how does that fit into some scheme of human origins? On page 42 of the book, the authors have a diagram entitled, “A Depiction of the Family Tree of Hominin Species.” It's a quite wobbly-looking diagram, not something that should cause anyone to think that our scientists have human origins figured out very well. This is because the diagram is one of those “tree of ancestry” types of diagrams, but four of the nodes in the diagram are question marks. From Unknown Ancestor 1 there descended Paranthropus boisei, Paranthropus robustus, Austrolopithecus africanus, Austrolopithecus afarensis, and Unknown Ancestor 2. From Unknown Ancestor 2 there descended Homo rudolfensis, Australopithecus sediba, Homo habilis, and Unknown Ancestor 3. From Unknown Ancestor 3 there descended Homo erectus, Homo floresiensis, Homo naledi, and Unknown Ancestor 4. From Unknown Ancestor 4 there descended modern humans, Neanderthals, and archaic African humans. So according to the diagram, there is not just one missing link, but four missing links. When you look at the diagram, it seems to have quite a bit of arbitrary guesswork. If you do a Google image search for “Hominin family tree,” you will see other diagrams, some of which give a different story. The ancestry tree in an article at Britannica.com has even more question marks, having a total of 7 question marks, indicating seven missing links. 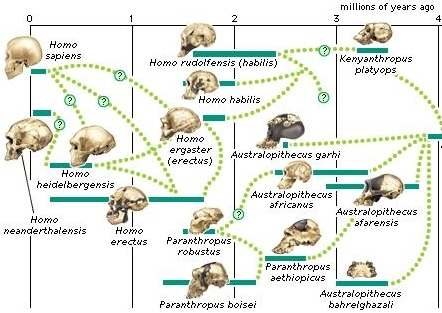 The diagram in the Almost Human book puts Homo floresiensis in the left top of the “tree of ancestry,” claiming Homo floresiensis was close to being an offshoot of Homo erectus. A recent study rejects this positioning, claiming that Homo floresiensis has a completely different ancestry, and was an offshoot not of Homo erectus but Homo habilis. 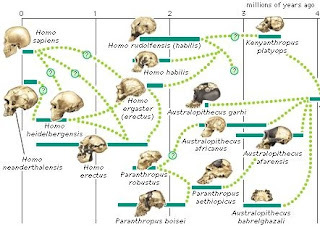 Given such a confusing hominid fossil record, with a large variety of different skulls found at different places around the world, it is no wonder that paleontologists often disagree with each other in drawing a tree of human ancestry. Part of the uncertainty is because our paleontologists do not have what they would like to have. This is one of the dirty little secrets of modern evolutionary biology. Our evolutionary biologists do not have the DNA evidence they need to solidify the claims they make about human origins. The problem is that regular organic material rots in less than a few thousand years, and you can't get much DNA from a very old fossil bone. It has been estimated that the half-life of DNA is only about 500 years. So we don't have any adequate DNA evidence from Homo erectus or Homo habilis, which are claimed to be ancestors or evolutionary cousins of the human species. The oldest DNA from a claimed human ancestor is a scrap of DNA dating back 400,000 years. But this is only about 16,000 base pairs, and the human genome is 3.2 billion base pairs. Such a tiny scrap doesn't give you a hundredth of what you would need to genetically verify that such an organism was an ancestor of humans. Imagine a trial in which the prosecution claimed that blood photographed at a crime scene is the blood of the person being tried. But imagine the blood was washed away by a thunderstorm before its DNA was checked, so no DNA match was made. That's the kind of position our evolutionary biologist is in. He really needs some complete Homo erectus DNA or Homo habilis DNA to back up his claims that these are human ancestors or human evolutionary cousins. But no such DNA exists, merely a rare scrap here and there. Does the fact that hominid fossils can be arranged into a “tree of ancestry” diagram prove that they have an evolutionary relationship? Not really. Given any large random data set, and a person determined to show some “tree of ancestry,” it is usually possible for a “tree of ancestry” to be created. 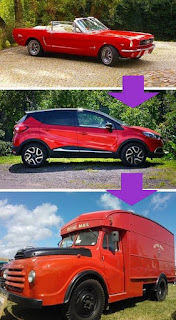 For example, if I go into the Yankee Stadium parking lot, and diligently start looking for cars that look like descendants of each other, I would be able to cherry-pick some cars and arrange them into a “tree of ancestry” showing what might look like a plausible evolutionary progression from one car model to another. But such a diagram (looking rather like the one below) would probably not be historically correct. But what about the fossils that Berger and Hawks found, the Homo naledi fossils? Are they, in fact, fossils of some species that was “almost human,” as the book title states? Not by a long shot. On page 193 of their book, the scientists finally give us an estimate of the brain size for the Homo naledi organisms corresponding to the fossils they found. It was about 560 cubic centimeters for a male, and about 450 cubic centimeters for a female. The average size of a male human brain is about 1350 cubic centimeters. So far from being “almost human,” Homo naledi had a brain only about 41% of the size of the modern human brain. Which means that Homo naledi was apparently well short of being even half-human. So given that our paleontologists have written a book with the title Almost Human: The Astonishing Tale of Homo naledi and the Discovery That Changed Our Human Story, we must ask: why did they choose to call their book “Almost Human”? Is it because such a title would sell more copies than an accurate title such as “Not Even Half Human”? A recent article in the New York Times discusses the failure of attempts to find evidence for the physics theory called supersymmetry. 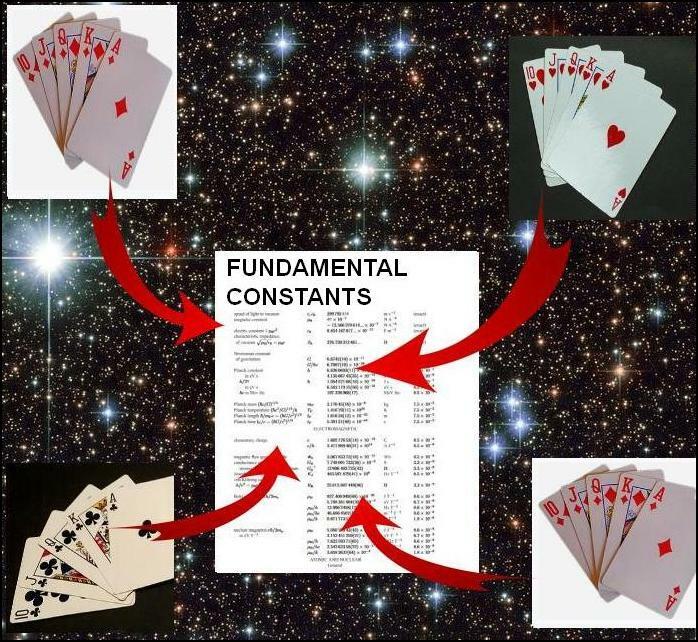 The Standard Model of physics has fewer than 30 independent parameters. But according to one scientific web site, supersymmetry has more than 100 independent parameters. According to another page at the same web site, more than 10,000 scientific papers “reference” the theory of supersymmetry. With all that work by physicists, you would think that there must be some evidence for supersymmetry. But efforts to find evidence for the theory have been a complete failure. The Large Hadron Collider has completely failed to support the theory. In the Standard Model, the electroweak scale receives enormous Planck-scale quantum corrections. The observed hierarchy between the electroweak scale and the Planck scale must be achieved with extraordinary fine tuning. In a supersymmetric theory, on the other hand, Planck-scale quantum corrections cancel between partners and superpartners (owing to a minus sign associated with fermionic loops). The hierarchy between the electroweak scale and the Planck scale is achieved in a natural manner, without miraculous fine-tuning. The “miraculous fine-tuning” being talked about here (what is known as the hierarchy problem) is a kind of matching of two unrelated numbers so that they end up canceling each other out – rather like what you might have if you had to pay on Friday a $5000 payment to save your house from foreclosure, and you coincidentally won $5000 in the lottery on Friday morning. But this hierarchy problem is actually much more of a coincidence. Because according to this scientific web site, “one has to hypothesize that the several correction terms cancel out to a part in 1034 (a hundred billionths of a billionth of a billionth of a billionth), if one is to make the Higgs mass smaller than a lead brick.” So maybe our analogy should be that you own 6 houses that are each behind $5000 on the mortgage, with Friday being the last day for you to save them; and you coincidentally on Friday morning buy 6 different lottery tickets that each win $5000. That's the kind of fine-tuning that seems to be involved in the case of the hierarchy problem. Supersymmetry (also known as SUSY) is an attempt to explain away this “miraculous fine-tuning.” But supersymmetry has always been a ridiculously ornate contrivance. For example, it imagines that almost every known type of particle has a corresponding “superpartner.” It would be quite the fantastic coincidence if nature was set up in such a way. So supersymmetry is basically a kind of gigantic case of “robbing Peter to pay Paul.” It tries to get rid of one fine-tuned coincidence (the hierarchy problem) by introducing a whole bunch of other fine-tuned coincidences, involving all these cases in which a known type of particle happens to have a matching “superpartner” particle. It's kind of the same approach taken by a similar theory, the theory of cosmic inflation or exponential expansion. That theory tries to get rid of a case of extreme fine-tuning in the universe's first second, but it does it by making assertions that require their own fine-tuning in numerous ways. So it's just robbing Peter to pay Paul. There is no real net reduction in the amount of fine-tuning required. For years scientists were hoping that the Large Hadron Collider would produce some evidence for supersymmetry. But no evidence has been produced. The chance of supersymmetry being confirmed in our lifetimes now seems almost zero. That's no surprise. Supersymmetry is a case of trying to explain away an example of cosmic fine-tuning, and there has never been a confirmed success in any effort to explain away any case of cosmic fine-tuning. The cosmic inflation theory (the theory of exponential expansion in the universe's first second) has been sociologically successful, a case of a thought virus that spread widely. But it has not been scientifically successful, because no evidence has been produced for it (and there are many problems with the theory). Rather than investing so much time and effort on supersymmetry, physicists would have got a lot better return if they had invested instead in super heroes. There are several ways physicists could have done that. The first way would have been to invest in physics technologies that might have given us high-tech gadgets that would allow someone to have the equivalent of a comic super-power. Physicists might have invented some fancy gadget that would give some of the powers of Batman's utility belt. Or they might have invested in some bullet-stopping force field that might have worked kind of like Wonder Woman's bracelets. Or physicists might have invested in some super-strong material that would give someone some of the powers of Spider Man or Iron Man. Or, physicists could simply have invested in super heroes without doing any research. 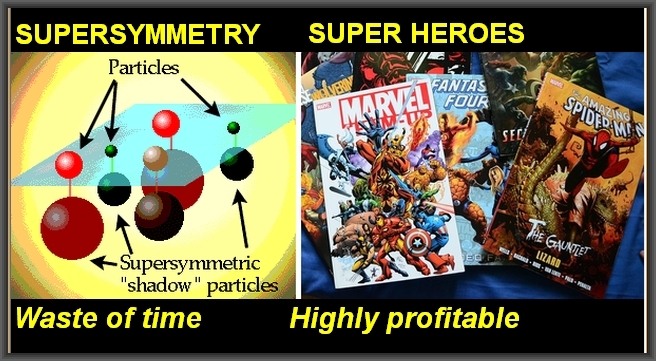 They could have taken all that money wasted on supersymmetry papers, and invested the money by either buying super hero comic books, or investing in companies such as Marvel that published comic books. Comic books have long been collector's items, and a comic book which sold for 12 cents back in the 1960's may sell for hundreds of dollars today. Disney paid 4 billion dollars for Marvel Entertainment. If physicists had invested in super hero comic books or the companies that published them, the physicists could have made gigantic returns for themselves or for the colleges or universities where they work. I must confess that I myself am guilty of failing to see how much money could be made from comic books and from another collector's item: baseball cards. When I lived in a dull Maryland suburb in the early 1960's, I had lots of comic books and many baseball cards. In the suburb I lived, elementary school students were preoccupied with baseball cards. The kids would gamble the cards in various ways, which made a fun pastime. One game worked like this: you would take your stack of cards, and face your friend who also had a stack of cards. After each of you shuffled your stack, both of you would deal them into a common stack. First you would deal a card, then your friend. If your friend dealt a card with one top color bar, and you then dealt a card on top of that stack with the same color bar, you would win the entire stack that had been dealt. In my suburb it seemed every family with boys had a cardboard box of baseball cards. But when I was eleven I moved to a very different environment: the more sophisticated locale of Washington D.C. Of course, I packed my comic books and baseball cards, and I hoped the kids there would be as interested in these as the kids in my Maryland suburb. But it seemed that none of the Washington children had the slightest interest in baseball cards. And they didn't seem too interested in comic books. I kind of thought to myself: I guess the city kids are too sophisticated for these things – maybe they're just silly suburb things. So not very long after moving to Washington D.C, I threw away all my baseball cards and comic books. What a mistake! I could have made thousands if I had kept them. Whether children at a particular school gamble with baseball cards is a sociological consideration, a vogue of a particular locale. When groundless theories such as supersymmetry become all the rage among little academic tribes, it seems to be also a sociological consideration, a case of some vogue that went viral when it shouldn't have. Scientific American columnist Michael Shermer has a new column entitled “Why the 'You' in an Afterlife Wouldn't Really Be You.” Arguing against both spiritual concepts of an afterlife and technological concepts of a “digital afterlife,” Shermer attempts to give three arguments against the possibility of an afterlife. First, there is the assumption that our identity is located in our memories, which are presumed to be permanently recorded in the brain: if they could be copied and pasted into a computer or duplicated and implanted into a resurrected body or soul, we would be restored. But that is not how memory works. Memory is not like a DVR that can play back the past on a screen in your mind. Memory is a continually edited and fluid process that utterly depends on the neurons in your brain being functional. This argument is not valid against any of these three ideas of an afterlife: (1) the idea that you have some immaterial soul that will survive death in a kind of natural way, without any divine intervention required; (2) the Christian idea that the dead will be physically resurrected by some divine agent; (3) the idea that minds may be uploaded into computers in the future, providing people with a digital afterlife. The first of these ideas does not depend on the idea that memories are permanently recorded in the brain. A person believing in a soul may believe that memories are stored largely in some soul, and may deny the claim that memory depends on neurons (a claim scientists haven't proven). The argument also does not debunk the idea of a physical resurrection of the dead. In such a case the neurons of individuals would presumably be recreated. The argument also does not debunk the idea of uploading minds into a computer. If our memories now depend on neurons (and there are reasons for doubting that), that is merely a current dependence, that could in theory be overcome if some new type of computer could be created that could store the equivalent of human neural states. In his second argument, Shermer attempts to stretch out one of the arguments made against mind uploading, and turn that into an argument against believing in any type of afterlife. Mind uploading is the idea that in the future it will be possible for people to transfer their consciousness into a computer. The idea is that we will be able to scan the human brain, and somehow figure out some neural pattern or synaptic pattern that uniquely identifies an individual. Then, it is argued, it will be possible to recreate this pattern in some super-computer. It is claimed that this could be a method of getting a digital afterlife. Some futurists claim that if someone were to have his brain scanned and then have his neural patterns transferred to a computer, that person could discard his body, and continue to live on indefinitely within a computer. Second, there is the supposition that copying your brain's connectome—the diagram of its neural connections—uploading it into a computer (as some scientists suggest) or resurrecting your physical self in an afterlife (as many religions envision) will result in you waking up as if from a long sleep either in a lab or in heaven. But a copy of your memories, your mind or even your soul is not you. It is a copy of you, no different than a twin, and no twin looks at his or her sibling and thinks, “There I am.” Neither duplication nor resurrection can instantiate you in another plane of existence. Minus the clumsy twin reference, this argument has considerable force against the idea of a digital afterlife through mind uploading. If I were to scan your brain and recreate your neural pattern inside a computer, that seems to be making a copy of your consciousness rather than a transfer of your consciousness, for two different reasons. The first reason is that a transfer has been made to a totally different medium (from a biological platform to an electronic platform). The second is that the mind upload seems to leave open the possibility of your biological body continuing after your mind upload has completed, and that would seem to be the creation of a copy of your consciousness rather than a transfer. But the copying argument has much less force (and perhaps no force) when used against the idea of a physical resurrection of the dead. In that hypothetical possibility, there is no transfer to a different medium. A physically resurrected body would be the same (or mostly the same) as the body that existed before someone died. Also, a physical resurrection would presumably only occur for people who had already died. So there would be no issue that both a source and a target (or copy) could exist at the same time. The copying argument has no force at all against the idea of a soul that continues to exist after a person's body dies. In such a case, presumably there would be no copy at all made of anything. A person who believes that the soul survives death does not tend to believe that the soul suddenly appears at the moment of death, suddenly having a copy of consciousness and memory that was stored in the brain. Such a person will instead tend to believe that the soul was a crucial component of the human mind all along (or perhaps was equivalent to the mind), and that such a soul simply continues to exist when a person dies. Imagine a person who has worn a heavy lead coat all his life, and has worn a dark glass fishbowl over his head all his life. Under the soul concept, we may regard death as being rather like a person shedding that heavy lead coat and dark-glass fishbowl, with the heavy lead coat and dark-glass fishbowl being the restrictions of movement and perception associated with a human bodily existence. 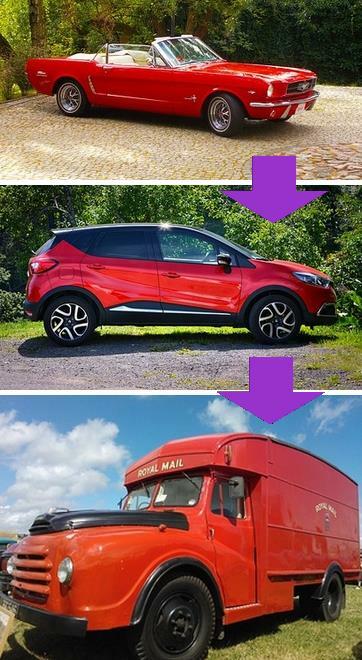 Under such a concept, there is no copying at all, but more like a kind of jettisoning, rather like a soaring rocket jettisoning a no-longer-needed fuel tank, with the body being what is jettisoned. Such a concept of the survival of the soul is completely free from difficulties involving copying, because no copying at all is assumed. 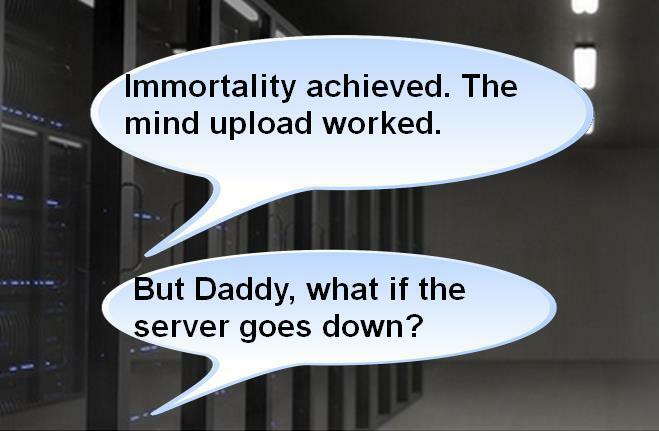 If you died, there is no known mechanism by which your POVself would be transported from your brain into a computer (or a resurrected body). A POV depends entirely on the continuity of self from one moment to the next, even if that continuity is broken by sleep or anesthesia. Death is a permanent break in continuity, and your personal POV cannot be moved from your brain into some other medium, here or in the hereafter. Such reasoning based on continuity might have some force against the concept of a digital afterlife by means of mind uploading, but probably not very much force as Shermer has stated it. For he's used the phrase “there is no known mechanism,” which is hardly going to discourage futurists who will claim that such a mechanism will be invented in the future. The reasoning here also has no force against either the possibility of a physical resurrection of the dead or the idea of a soul surviving death. A Christian believing that the dead will be physically resurrected will believe that this is done through divine agency, so it is futile to argue that such a thing cannot occur because there is “no known mechanism” by which it would occur. The person believing in a soul that survives death need not believe that any transfer, copying or moving occurs to allow a person to survive death. Such a person will tend to believe that the essence of a person – what makes you you – has already resided in your soul all along, not in your brain; and such a person is not required to believe that anything is transferred from the brain to the soul when a person is died. Under the idea of a soul, there is no break in continuity when a person survives death. Neuroscientists have always followed the principle: explain every conceivable mental activity as being something caused by the brain. But what we must remember is that Nature never told us that all our memories are stored in brains, or that our thoughts are generated by brains. It was neuroscientists who told us that, not Nature. For example, we have no understanding of how 50-year-old memories can be stored in brains, given all the rapid molecular turnover that occurs in brains. Below is a quote from a recent scientific press release, citing a comment by a neuroscientist. Neuroscience has also been struggling to find where the brain stores its memories. “They may be ‘hiding’ in high-dimensional cavities,” Markram speculates. Such a quote (which has a “grasping at straws” sound to it) gives a very strong impression that neuroscientists have no real basis for being confident claiming that long-term memories are stored in the brain. The type of evidence neuroscientists cite for their claims is often weak evidence that doesn't hold up to critical scrutiny, such as dubious brain scanning studies which typically take minor 1% differences in brain activity, and try to make them look like compelling signs of what the brain is doing, when they are no such thing. The idea behind a soul or spirit can be summarized as follows. You have a soul or spirit that is not at all a brain thing. You also have a brain, which serves largely for the purpose of localizing or constricting your mental activity, making sure that it stays chained to your body. The main purposes of the brain are things like control of autonomic functions, response to tactile stimuli, coordination of muscle movement, the coordination of speech, and the handling of sensory and auditory stimuli. There may also be some brain function relating to storing kind of what we may call “muscle memories,” which we use for performing particular physical tasks. These are all things related to living and surviving as a corporeal being. But things such as abstract thinking, conceptual memory and long term memory may be functions of a human soul. So when you die you may lose those things that you needed to continue walking about as a fleshly being, but may still have (as part of your soul) those things that were never necessary for such an existence (no cave-man needed to form abstract ideas, think philosophical thoughts, or remember his experiences as an 8-year-old). This idea may seem old-fashioned to some, but a strong argument can be made that it is compelled by fairly recent evidence, and that in such a sense it is not at all old-fashioned. It is only in recent years that we have discovered what a very high degree of molecular turnover occurs in the brain, which makes it so hard to maintain that 50-year old memories are stored in the brain, as discussed here. It is only in the past 50 years that we had research such as John Lorber's, showing astonishingly high mental functioning in patients who had large fractions of their brains (or most of their brains) destroyed by disease. It is only in the past 130 years that experimental laboratory evidence has been repeatedly produced for phenomena such as ESP, which cannot be accounted for as a brain effect. It is only in recent decades that we have had reports of near-death experiences, in which many observers have reported floating out of their bodies, often verifying details of their medical resuscitation attempts that they should have been unable to observe while they were unconscious. Such observations are quite compatible with the idea of a soul that survives death, and may force such a conclusion on us. Shermer seems rather to be thinking of the idea of the soul as something kind of like a USB flash drive to back up the brain. But those who have postulated a soul have more often supposed it as a crucial component of human mental functioning, not some optional accessory. Under the concept of a soul that accounts for a large fraction or most of human mental functioning, there is no requirement for any sudden copying from the brain to occur for someone to survive death; and there is also continuity, as death merely means discarding what you don't need to survive beyond death. As none of Shermer's three arguments damages such a concept, Shermer has not succeeded in closing the door to an afterlife. The National Geographic channel has a new TV series entitled “Year Million.” A recent episode in the series was entitled “Never Say Die,” and was about the prospects of human immortality. The episode was long on slick visuals, and short on intelligence. The episode presented the ideas that we will greatly extend human longevity by using nanobots and genetic engineering, and that later people will upload themselves into computers. The episode presented a simplistic view of biological life, one that is purely mechanistic, epitomized by a person who said, "We are still biologically hindered by the squishy computer in our heads.” The assumptions seemed to be that biological life is merely some mechanical phenomenon that humans can completely master through technologies such as nanobots and genetic engineering. These assumptions are quite dubious because of all the profound mysteries involving biological life. It is generally admitted that we do not understand the origin of life. It is generally admitted that we do not understand the mystery of protein-folding (why proteins conveniently form into three-dimensional shapes needed for our existence). It is generally admitted that we do not understand the mysteries of morphogenesis, how it is that a fertilized egg is able to progress to become a baby who then grows into a full-grown human. We also don't really understand the origin of species, as the theory of evolution by natural selection is merely a theory of accumulation rather than what we actually need to explain the mountainous degrees of coordination, structural fine-tuning, and functional coherence in our bodies: a theory of organization explaining the arrival of the fittest, not just the survival of the fittest. As discussed here, we also don't really understand where it is that the body plans of organisms are stored, because DNA is a minimal “bare bones” language unsuitable for describing three-dimensional body plan blueprints; so while DNA might be storing a list of chemical ingredients, it does not actually seem to have a specification of our body plans. We therefore have every reason to suspect that biological life involves some mysterious forces or factors very far beyond our understanding. If that is the case, then the prospect for vastly increasing the human lifespan through injecting humans with tiny robots called nanobots and tinkering with DNA may be much less bright than many think. But there is some reasonable hope that genetic engineering or nanobots might extend the human lifespan, so this part of the TV show wasn't nonsensical. The show did become nonsensical when it discussed the very dubious concept of mind uploading in a completely uncritical manner. Among the reasons why mind uploading is such a dubious concept is that we have no understanding of how a brain could even be storing memories that last for decades, given all the rapid molecular turnover and protein turnover that occurs in brains; and we have no idea of how brains can generate abstract ideas. Mind uploading cannot possibly work unless some reductionist model of consciousness and memory is correct; and there are very good reasons (discussed here and in this series of posts) for doubting that any such model is correct. A lot has to be done before we can figure out whether we can take a pattern of connectivity from a brain and upload it or copy it. It's going to happen; I'm positive of that. Everything's moving in that direction. Graziano's certainty on this matter is laughable. There is no basis for believing that minds can ever be uploaded. There is no progress at all in mind uploading. Instead of “everything's moving in that direction,” the situation is actually, “nothing's moving in that direction.” And why is Graziano saying he's sure it's going to happen, just after saying, “A lot has to be done before we can figure out whether we can take a pattern of connectivity from a brain and upload it or copy it”? Those two thoughts contradict each other. The show then quotes string physicist Michio Kaku, who nowadays seems to have his head popping up on every science or futurism documentary put on television. Kaku states, "Believe it or not, we can actually upload memories, and record memories in mice.” This statement is false. The actual claims that have been made by certain mice researchers (researchers in optogenetics) is that memories in mice can be blocked or activated. Such claims are not well founded, and are based on a few doubtful studies using a dubious methodology. The studies typically report weak levels of statistical significance. See here for a discussion of the flaws in some of these studies. Once we shed our physical bodies, we will exist only as a computer copy of our brains. It's hard to imagine exactly, but basically you'd be digital information stored on a server. But when we start talking about immortality, that's a whole other can of worms. If we really are serious about getting to forever-land, we'll have to replace our carbon based human bodies and upload ourselves to a super-computer. We're talking about everlasting life in a digital paradise....All of society will live digitally in a virtual world called the metaverse that's a thousand times more intense than the one you live in now. There are quite a few reasons why such a thing is very unlikely to happen. First, the brain does not store digital information, so the mind is very likely not something that can be uploaded into a computer. Second, there is not the slightest evidence that the brain uses any type of readable code to store information. DNA uses the genetic code, something we can understand and read. But we have zero knowledge of anything like a brain code that we can use to read information from the brain. Nor can we plausibly imagine how such a code could have originated, as it would have to be something almost infinitely harder to explain than the genetic code (the origin of which is very hard to explain). Third, you could never electronically capture the exact state of a particular person's brain, even if you tried to use microscopic nanobots to do such a thing. Imagine trying to exactly map every synapse and neuron in a brain with nanobots. Each of the brain-mapping nanobots would have to somehow be aware of its own exact position in the brain, so it can record the exact position of each neuron and brain connection it encounters. So if a nanobot comes to a neuron that is 1.334526 centimeters from the left edge of the skull, and 2.734538 centimeters from the right edge of the skull, and 5.292343 centimeters from the back of the skull, then those exact coordinates must be recorded. But how can a microscopic nanobot do that? You can't supply a microscopic nanobot with a little GPS system allowing it to tell its position. So it would seem that nanobots are completely unsuitable for any such job as mapping the exact physical microscopic structure of an organ with billions of cells and synapses packed together in a small space. Then there's the duplication problem. Imagine if there was a machine that could scan your brain, and then upload your mind to a computer. Even if that process was done perfectly, the computer would not have your mind. It would instead have a copy of your mind. You may realize this just by considering that if this uploading process didn't kill you, and the computer with your “mind upload” existed at the same time as you, there wouldn't be two you's. There would be one you, and a copy of you living in the computer. If you then died after this upload, it would not at all be true that you had survived death by the fact that a copy of your mind was in the computer. None of these difficulties are discussed on the “Year Million” TV show. The show presents mind uploading as a sure thing, ignoring all the reasons for thinking that it can't ever happen. Not only did the TV show present mind uploading as something that will likely happen; the TV show assured us that mind uploading is the key to true immortality – on the grounds that once you are living in a computer server, you are guaranteed to live forever. This is nonsensical, because the programs running on computer servers sometimes crash and stop working; the programs running on computer servers are sometimes deliberately halted; and the computer servers themselves sometimes crash, lose power, or are turned off. If you were living in a computer server, there is no reason why you should be confident that you will be around for more than a century or two. The next episode of the “Year Million” TV series continued to be largely about mind uploading, speaking as if this extremely doubtful idea was on solid ground. There was also a pitch for the idea that we are already living inside computers. The “Year Million” TV series is on track to be the silliest documentary series ever put on about the human future. Given our very low state of knowledge about the most basic riddles of biology, memory and consciousness, fantasies of mind uploading are rather like the fantasies of some boy who knows almost nothing about the contents of the sun, but who fantasizes that he will one day reorganize the sun into a shape and color more pleasing to him. Can we account for all of man's mental activities by assuming that they can all be explained by the brain? When considering this question, it may make sense to distinguish between different levels of human mentality, with each level being more more difficult to explain than the previous level. For it might be that our brains are sufficient to explain one level, but insufficient to explain a more advanced level. Below are seven levels of mentality we can distinguish. Level 1: Let us imagine a very young baby lying in a crib near a window. 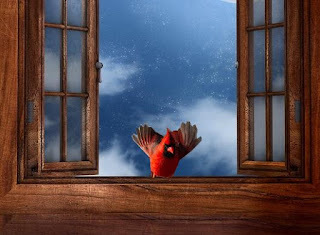 A red bird flies and lands on the windowsill. The baby looks out at the bird, and perceives the bird's color. But there is no recognition, and the baby feels neither fear nor wonder at the sight of the bird. There is no thought or emotion, but merely sensory perception. Level 2: Let us imagine the same event happens. The baby is lying in its crib, and a a red bird flies and lands on the windowsill near the crib. But let us suppose the baby is a little older, and now something a little more advanced happens. The baby feels an emotion of wonder or delight. But there is still no recognition, and no memory is involved. Level 3: Let us imagine the same event happens. The baby is lying in its crib, and a a red bird flies and lands on the windowsill near the crib. Let us imagine this baby is now almost a toddler. The baby feels an emotion of delight or wonder at seeing the bird, but now some memory is involved. Without thinking any words, the child has a vague feeling of recollection, the feeling that he has seen such a bird before. Level 7: Now let us imagine the person is no longer a child, but is now sixty years old. He can write in depth about many advanced philosophical questions; he can feel many refined emotions; and he is quite capable of writing an entire book about birds. Moreover, he can instantly recall memories that happened five decades ago. So perhaps he remembers the day 50 years ago when he first saw a beautiful red bird in his backyard. Now, which one of these levels can we explain by assuming brain activity? Some philosophers would deny that even Level 1 can be explained by brain activity. As rudimentary as Level 1 is, it is still an example of Mind, and some philosophers say that we cannot explain how Mind can arise from mere matter. But perhaps they are wrong, and perhaps we can explain Level 1 by assuming that it involves merely sensory perception, which parts of the brain might explain. Conceivably we also might explain Level 2 also by imagining that some kind of hormone or chemical produces a feeling of wonder or delight. But we cannot explain Level 7 through brain processes. For we cannot explain any way in which the brain could store memories for decades; we cannot explain how brains could instantly recall distant memories; and we cannot explain how a brain could generate abstract thoughts. Consider the storage of memories. It has been proven through the work of scientists such as Bahrick that humans can store memories fairly reliably for more than 50 years. In order for you to have a workable theory for how brains can be storing memories, a neuroscientist would need to plausibly explain how human memories could be stored in a brain for 50 years. No scientist has done any such thing. The main theory for how the brain stores memories is the idea that our synapses store memories. But there is a reason why this theory does not work. As discussed here, synapses are subject to very strong molecular turnover and structural turnover which should prevent them from storing memories for longer than a year. The proteins in synapses have an average lifetime of only about a week. As a scientific paper puts it, "Thus, the constituent molecules that subserve the maintenance of a memory will have completely turned over, i.e. have been broken down and resynthesized, over the course of about 1 week." Not only do neuroscientists fail at explaining how very long-term memories can be stored in the brain; they also fail to explain human memory retrieval. The two main problems in explaining human memory retrieval are these: (1) the problem of explaining how a human being could find the exact location where a memory might be stored in the brain; (2) the problem of explaining how we are able to recall obscure and old memories with such blazing speed. If human beings took 30 minutes to retrieve a memory, the difficulty would not be so great. We might imagine that a brain simply scans all of our memories, looking for the right one, like a person flipping through the pages of a book looking for a topic. But given the instantaneous memory recall of distant, trivial memories shown on TV shows such as Jeopardy, it is obviously not true that you read through all your memories until you find something. How are computers able to retrieve information so quickly? Through indexing, which requires sorting. But there is zero evidence that the brain does any type of physical sort or physical indexing. The brain does not have the type of architecture to support physical sorting or indexing. So our memories cannot be indexed in the way that computer information is indexed. In short, there is no viable explanation as to how a brain could be able to find so quickly a spot in the brain where a memory was stored. Nor does it work to claim that memories are stored everywhere in the brain. The idea that every memory is stored everywhere in the brain is nonsensical. Although neuroscientists are very bad at explaining how a brain could store or instantly retrieve memories lasting for decades, neuroscientists are even worse at explaining how brains could possibly be generating ideas and abstract thought. The first and top-rated answer on this "expert answers" site is given by one Phil Macquire, an individual who has no listed scientific credentials, and who has primarily answered movie questions on this site. Phil gives an answer that shows some literary skill but provides no real insight at all as to how a brain could generate ideas. He says, "How the subconscious mind performs this incredible feat is such a mystery." The next answer by Tanush Jagdish begins by saying, “We don't know,” but then suggests “synaptogenesis,” the creation of new synapses. This is not a plausible idea. Some text such as “tall blue cold triangle” can instantly create an idea in your head that you have never had before, and you certainly did not have to wait for new synapses in your brain to form before you had such an idea. The next answer by Jeff Nosanov is a circuitous answer that explains nothing, while claiming incorrectly that “ideas cannot be made to happen.” Nosanov ends by saying “that was not a physiological explanation.” Then the page has some answers by non-scientists which are not illuminating. A similar page on the “Ask science” sub-reddit at www.reddit.com offers equally little illumination. A Google search for “how the brain generates ideas” will result in a vast wasteland of results failing to offer a single neuroscience study offering any real illumination on this topic. One of the items you will get is a Harvard news story with the title “How the brain builds new thoughts.” But the story is discussing some research that does nothing to explain such a thing – just another one of those oh-so-dubious brain scanning studies in which some scientists scan brains and find trivial differences in blood flow (see here on why such studies are typically of little value). Essentially the only idea that neuroscientists have to explain a brain creating ideas is some idea of combination, kind of the idea that you create a complex idea by combining simpler ideas. This does not explain the miracle of abstract thought. Let us imagine a savage who experiences 100 cold days, and who then reaches the abstract concept of coldness. This idea is not reached from any type of combination – it is reached by abstraction. Similarly, a person who sees 100 other humans may reach the abstract idea of a human being. But that idea is not reached by combination. Computers offer not the slightest clue as to how abstract thinking can occur, because no computer has ever had a concept, an idea, or an abstract thought, something that requires a conscious mind. Don't be fooled by the type of computer program called an idea generator. Such programs are typically just programs for combining words into novel combinations. Until a human reads the output of such a program, an idea is not actually created. In short, there is no plausible brain explanation for how humans could be storing memories for 50 years; there is no plausible brain explanation for how humans can instantly retrieve distant memories; and there is no plausible brain explanation for how humans can even create abstract ideas. See here and here for additional support for these claims. 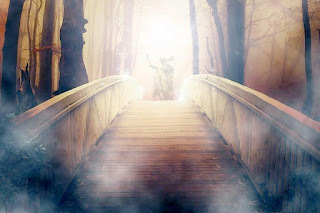 It is sometimes argued that we need to postulate something like a human soul or spirit (something beyond the brain) to account for paranormal phenomena such as ESP and near-death experiences. It may also be argued very forcibly that we need to postulate something like a human soul or spirit to account for certain types of normal mental functioning that we observe every day. High-dimensional cavities? Cavities are holes, not information storage media. I think the quote bolsters my claim that scientists do not have any plausible explanation of how brains can be storing memories for 50 years. Cases such as these seem incompatible with the idea that you brain is the sole source of your mind, but are quite compatible with the idea that your soul is a large source of your mental functioning. That visual is an exaggeration, since biomedical research isn't dead. But judging from the book, there are serious problems in the field. It seems that a very large fraction of research studies cannot be replicated. The problem was highlighted in a widely cited 2005 paper by John Ioannidis entitled, “Why Most Published Research Studies Are False.” A scientist named C. Glenn Begley and his colleagues tried to reproduce 53 published studies called “ground-breaking.” He asked the scientists who wrote the papers to help, by providing the exact materials to publish the results. Begley and his colleagues were only able to reproduce 6 of the 53 experiments. In 2011 Bayer reported similar results. They tried to reproduce 67 medical studies, and were only able to reproduce them 25 percent of the time. On page 14 of the book by Harris, we are told that one expert estimates that 28 billion dollars a year is spent on untrustworthy papers. A 2007 study estimated that between 18 and 36 percent of all cell experiments use misidentified cell lines. That adds up to tens of thousands of studies, costing billions of dollars....Sometimes, even the species isn't correct. Nelson-Rees found a “mongoose” cell line was actually human and determined that two “hamster” cell lines were from marmosets and humans, respectively. “Have the Marx Brothers taken over the cell-culture labs?” Roland Nardone asked in a 2008 paper bemoaning this state of affairs. In a 2013 study, a dozen doctors from around the country examined all 363 articles published in The New England Journal of Medicine over a decade — 2001 through 2010 — that tested a current clinical practice, from the use of antibiotics to treat people with persistent Lyme disease symptoms (didn’t help) to the use of specialized sponges for preventing infections in patients having colorectal surgery (caused more infections). Their results, published in the Mayo Clinic Proceedings, found 146 studies that proved or strongly suggested that a current standard practice either had no benefit at all or was inferior to the practice it replaced; 138 articles supported the efficacy of an existing practice, and the remaining 79 were deemed inconclusive. 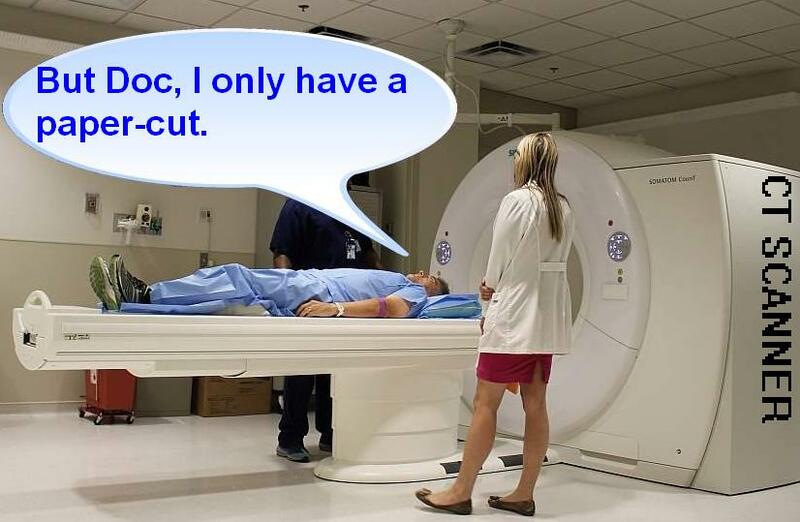 Another huge problem in contemporary medical practice involves doctors who invest in fantastically expensive equipment, and who then give advice that may be biased by their desire to pay off the cost of such a machine (or profit from its use). In just a single year, the researchers reported, twenty-five to forty-two per cent of Medicare patients received at least one of the twenty-six useless tests and treatments....The Institute of Medicine issued a report stating that waste accounted for thirty per cent of health-care spending, or some seven hundred and fifty billion dollars a year, which was more than our nation’s entire budget for K-12 education....Millions of people are receiving drugs that aren’t helping them, operations that aren’t going to make them better, and scans and tests that do nothing beneficial for them, and often cause harm. (1) Is the course of treatment or testing you are recommending considered a standard practice or "best practice" for patients with my set of circumstances? (2) If you were teaching a room full of medical students, would you recommend this exact treatment or testing for someone with my set of circumstances? Look for a firm, confident answer of "Yes," rather than a weaker answer such as "Doctors often do this." During earlier times, people had complete faith in words spoken by anyone wearing the black outfit of the priest. Today we have somehow been socially conditioned to regard anyone with a white coat as a totally reliable source of information. Perhaps both forms of “color confidence” involved too much uncritical trust. More than 70% of the researchers (pdf), who took part in a recent study published in Nature have tried and failed to replicate another scientist’s experiment. Another study found that at least 50% of life science research cannot be replicated. A Nature article states this: "Although 52% of those surveyed agree that there is a significant ‘crisis’ of reproducibility, less than 31% think that failure to reproduce published results means that the result is probably wrong, and most say that they still trust the published literature." This smells like scientists having too much overconfident faith in their fellow scientists. If we nudge the strength of the strong force upwards by just 0.4 per cent, stars produce a wealth of carbon, but the route to oxygen is cut off. While we have the central element to support carbon-based life, the result is a universe in which there will be very little water. 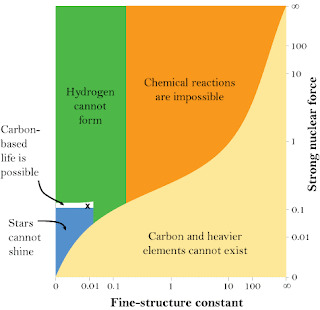 Decreasing the strength of the strong force by a similar 0.4 per cent has the opposite effect: all carbon is rapidly transformed into oxygen, providing the universe with plenty of water, but leaving it devoid of carbon. Protons and neutrons are made up of smaller particles called quarks. A proton is made of two up quarks and one down quark, while a neutron is made of two down quarks and one up quark. On page 50 to 51 of the Fortunate Universe book, we are told some reasons why a life-bearing universe requires that these quark particles have masses not too far from the mass they have. If the down quark was about 70 times more massive or the up quark was about 130 times more massive, there would be only one element, and complex chemistry would be impossible. More sensitively, if the up quark was more than six times more massive, protons could not exist, and there would be no atoms. But later we learn of a much more sensitive requirement demanding that the quark masses be almost exactly as they are in order for the universe to be hospitable for life. And remember from last chapter that because the quarks are already “absurdly light” in the words of physicist Leonard Susskind, a range of mass that is a small percentage of their value in our Universe corresponds to a tiny fraction of their possible range. It is about one part in a million relative to the Higgs field, which gives them their mass. It is about one part in 1023 relative to the Planck mass! On page 75 of the book we have a diagram that is basically the same as the diagram below from an article by one of the authors. The author shows that if you make random values for the strong nuclear force and a fundamental constant called the fine structure constant, then only a very tiny fraction will allow carbon-based life. Because the graph uses a logarithmic scale, it visually exaggerates the size of the tiny white rectangle. If you were to program a computer to assign random numbers for these two (the strong nuclear force and the fine structure constant) between 0 and 1000, less than one in a million times would the numbers end up within the tiny white rectangle. Life requires a value not too much different to what we observe. There must be an as yet unknown mechanism that slices off the contributions from the quantum vacuum, reducing it down to the observed value. This slicing has to be done precisely, not too much and not so little as to destabilize the rest of particles. This is a cut as fine as one part in 1016...This problem – known as the hierarchy problem – keeps particle physicists awake at night. A small decrease in the strength of the strong force by about 8 per cent would render deuterium unstable. A proton can no longer stick to a neutron, and the first nuclear reaction in stars is in danger of falling apart. An increase of 12 per cent binds the diproton – a proton can stick to another proton. This gives stars a short cut, an easy way to burn fuel. If the diproton were suddenly bound within the Sun, it would burn hydrogen at a phenomenal rate, exhausting its fuel in mere moments. Maybe there is a mechanism at work here, a mechanism that we clearly don't yet understand, which trims the energy in the quantum vacuum; so, while it is intrinsically very large, the value we observe, the value that influences the expansion of the universe, appears to be much, much smaller. But this would have to be a very precise razor, trimming off 10120 but leaving the apparently tiny amount that we observe....But what if this mechanism for suppressing the influence of the cosmic vacuum energy was not so efficient, removing the effect of 10119 rather than 10120, so there would be ten times the vacuum energy density we actually measure? Remember, such vacuum energy accelerates the expansion faster and faster, emptying out the Universe, cutting off the possibility of stars, planets, and eventually people. Towards the end of the book, the authors discuss some common objections made to minimize the importance of such conclusions. One objection goes like this: improbable things happen all the time (for example, there was only 1 chance in a billion that you would have the 9-digit Social Security number that you have). The objection is easily dismissed on these grounds: improbable things do happen all the time, but improbable lucky things do not happen all the time. The cases of cosmic fine-tuning are not merely improbable things happening, but incredibly improbable lucky things happening; and it is not at all true that incredibly improbable lucky things happen all the time. Another objection appeals to the existence of a multiverse: maybe there are an infinity of universes, and in such a case the odds of one of them being successful might be good. This is not a sound objection because it merely increases the number of random trials; and increasing the number of random trials does nothing to increase the chance of any one random trial succeeding. If you drive into Las Vegas and drive out with $50,000,000 in your car, that's an astonishing piece of luck; and it's no less astonishing if there are an infinity of such lucky winners scattered across an infinity of universes in which an infinity of different things happen. Adding a multiverse does not increase the odds of lucky events in any one particular universe such as ours.